To say that I was excited about Halloween this year would be an understatement. You see, for the past dozen or so years I’ve lived in an apartment. Which means no front yard to decorate, and no trick or treaters. I have been utterly deprived of partaking in the type of Halloween shenanigans that I love. No jack o’ lanterns. No bowls of Snickers. No gushing over the adorable cuteness of two-year-olds dressed up as ladybugs brought to my door by encouraging parents. No scaring the crap out of teenagers dressed as, well, teenagers, who are too old to trick or treat but who come to my door nonetheless. DEPRIVED. But this year was different. This year I live in a HOUSE. With a FRONT YARD. I promised Adam that I wouldn’t decorate until October. In my mind, that meant October 1st. He thought that was excessive. I thought it was being appopriately conservative. Who wants to see ghosts and goblins in September? Well…I do, but I tried very hard to contain my enthusiasm. Adam thought I was crazy. Until about a week before Halloween. 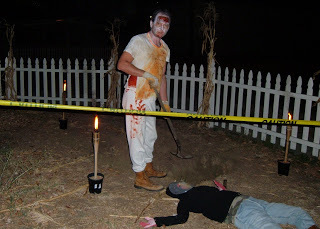 Adam started questioning me about how I was planning to make the front yard scary. I thought it was scary already – four gravestones, two ghosts, a severed hand, a giant black widow spider crawling up the side of the house, the front porch encased in spiderwebs. Isn’t that scary? I didn’t even know if we were going to get any trick or treaters. The only neighbor I talked to about it is never home that night. I was hesitant to spend too many hours on what would amount to four kids. I’d already spent an entire Saturday tarting up the yard. What? Since when did the Halloween Scrooge become Dr. Death himself? I latched onto this idea real quick, and told him that under no circumstances was he allowed to back out now that he made the offer. And since our landlord is in the process of tearing up our front yard, digging a big hole wasn’t as reckless as it sounds. “And I could make us up like zombies!” I suggested. “And I could make some dead bodies so the kids won’t know which of us is real and which is fake! And I’ll get a fog machine! And a strobe light! And play scary music!” I was gushing. This was too exciting. The big night came. It may as well have been prom, what with my ridiculous gangbusters attitude and my decision to devote the entire day to getting ready. We rigged up all the special lighting. I got the music going. We decked ourselves in full zombie attire complete with dripping, gooey (and chocolaty-tasting!) blood. We lit torches. Adam got out the shovel and started digging. And we waited. And waited. And waited. 5:30 – no early birds. Okay, no problem, I thought, it’s a school night. 6pm. No kids. 6:30pm. No kids. Adam and I started to realize this may be a colossal let down and waste of time. 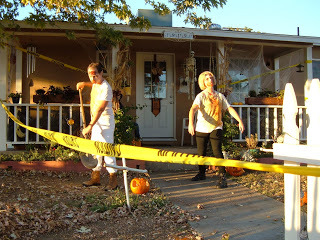 But hey – we were entertaining each other, walking around the yard in our zombie walk as people driving by gave us weird and slightly concerned looks. And then, finally, we got a couple kids. And a couple more. Then 20 showed up at once and we started to get a pretty steady stream. And then I realized that over half the houses on our street had their lights off. There was a serious case of non-participation going on in our neighborhood. 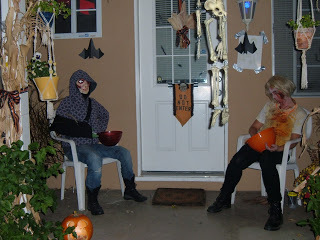 These poor kids sometimes walked by 3, 4, even 5 houses before they came to one that was giving out candy. How lame is that? And then I started to notice that every kid that I gave candy to – every single one – said thank you. Even the high school kids. And we got alot of high school kids. We live in what some consider a rough neighborhood, and the high school down the street – Reseda High School – has had shootings and gang activity. Our mailbox was tagged when we moved in. Many of the kids had on Reseda High School shirts, and if I saw them walking down my street on a normal night they’d be on my radar. But all of them were so polite and seemed genuinely appreciative – not only for the candy, but for the house, for really doing it up, for the effort. For caring. For caring enough to try to scare the crap out of them. And we did. There were 5 kids who wouldn’t even come into the yard. Quite a few I made scream (much to their parents’ delight). And I can’t tell you how many times we could hear people talking to each other on their way out of the yard, saying “that was the best house I ever went to!”. I started to realize that by making such a big deal out of doing up our yard, that we were in our own small way, participating in the community. We were saying that, hey, we’re part of this neighborhood too, let’s have some fun! Instead of turning off the lights and pretending we weren’t home. I think our neighborhood could use some more of that kind of attitude. And I’m glad we did it. I think I would have been glad even if we only got 4 kids. 4 kids are worth it, too. At the end of the night, after giving candy and screams to about 75 kids, Adam says to me “That was really fun. I’m glad we did it. Now lets go to the market across the street before they close and walk in as zombies and ask if the butcher if he has brains“. He even looked up how to say “brains” in Spanish. So we dragged ourselves to the market, and asked for “cereeeeeeebrooooos“. But we ended up getting chocolate ice cream instead. And a sprinkle cookie.